HANOVER, N.H. — Neighbors of Dartmouth College property where for years the Ivy League school disposed of mice and other small animals used in science experiments say they fear pollution from the site has contaminated their groundwater and they worry the school hasn’t been completely up front with them. The site has contaminated the well water of at least one family, that of Richard and Debbie Higgins, who blame a variety of health problems on it, including rashes, hair and skin loss and dizziness. Even their dogs were not spared, they say, with one urinating blood and another vomiting. “We have been drinking the water for years and we had no idea, absolutely no idea,” Debbie Higgins said. Few nearby residents even knew the half-acre plot on the college’s Rennie Farm was used from the 1960s until 1978 to dump carcasses from “tracer experiments,” in which scientists used radioactive compounds to see how things moved through life systems. A nearby site also contained remains of human cadavers and stillborn fetuses used in medical classes. The obscurity of the fenced site changed in 2011, when Dartmouth chose to clean it up, removing 40 tons of carcasses and soil from scores of unlined pits that were legal at the time they were dug. That led to the discovery of hazardous waste and low-level radioactive materials and eventually evidence that at least one chemical used in the animal experiments, the suspected carcinogen 1,4-dioxane, had leaked into the groundwater. It was initially found at 50 times the state standard of 3 parts per billion on the site and more recently as high as 600 parts per billion in the ground. The chemical has been linked to eye, nose and throat irritation and, in long-term exposure, to liver and kidney damage, according to the Environmental Protection Agency. 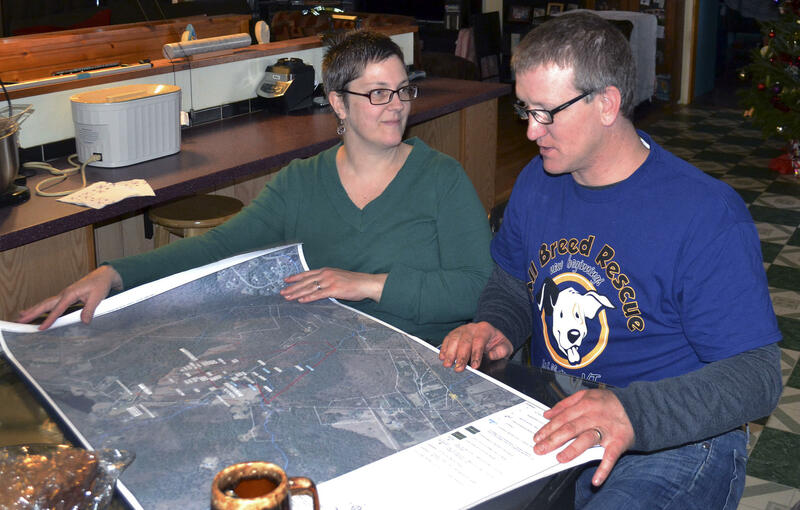 The 1,4-dioxane was eventually found to have migrated off the site and contaminated the Higginses’ well across the street, about 800 feet from the site — at twice the state standard. They learned in September 2015 that their well was polluted, and now depend on bottled water supplied by Dartmouth for cooking and drinking. The news has rattled the semi-rural neighborhood, sparking anger and fear among dozens of homeowners who worry the plume will reach their own wells and damage their property values. Many contend Dartmouth was too slow to respond once it found the contamination and has been reluctant to provide full details of what was on the site — something the college denies. The Higginses and other residents argue an alert about the spreading contamination should have gone out earlier. New Hampshire environmental and Dartmouth officials said initial test showed the levels of 1,4-dioxane were declining on the site and were projected to remain on the farm site — though state officials now concede there could have been more aggressive monitoring. Now, Dartmouth is working to regain the trust of Higgins and the other residents. It apologized in September for its handling of the case, established a neighborhood advisory panel and sampled 110 drinking wells in the neighborhood; no others have tested positive. It also offered 20 households bottled water. It is also finishing construction on a system at the dump site to capture and clean the contaminated water. When it begins operating in January, wells will pull contaminated groundwater into the system and filter it. The treated water will then be returned to the ground, a process that could take several years. “We are committed to protecting the health of our neighbors, addressing their concerns, and communicating regularly and openly with them about the project,” college spokeswoman Diana Lawrence said of the cleanup, which so far has cost $8.4 million. But for the Higginses and their neighbors, the college hasn’t gone far enough. Some want more soil removed, while others want Dartmouth to offer compensation for their deteriorating property values — demands the college says it is considering. The Higginses say their health problems have mostly disappeared since they switched to bottled water. But they call that a short-term fix and want the college to move them to a new home a safe distance from the site of the contamination.